Chard, Red Onion, Purple Basil Pasta Salad, Thyme for Cooking summer sides. 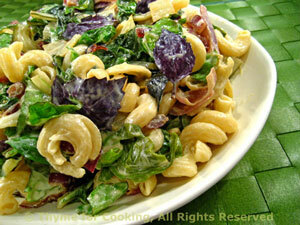 This is a colorful pasta salad with green chard, red onion and purple basil. Trim and slice chard, keeping stems separate from leaves as best you can. Add onion, garlic, chard stems and sauté 7 minutes, or until onion is tender. Add chard leaves and sauté just until starting to wilt, 3 - 5 minutes longer. Put yogurt, mustard, vinegar into a bowl and whisk together. Put pasta in large salad bowl. Add onion/chard, Yogurt Dressing, and toss to combine. Note: To slice the chard, stack the leaves neatly with the stem together. Fold the leaves in half the long way. Slice the stems, keeping them separate, then the leaves.